I swear that the month of December used to DRAG on forever when I was younger . . . and now, it FLIES by! I am kind of stressing out at all I still have to do, so dinner is quick and easy each night. My mom gave me this recipe and it is definitely a keeper! Even my husband, who says he doesn’t like meatballs, devoured it! The best part about it- it only takes 5 minutes of prep work and has 2 ingredients! Gotta love your slow cooker! Spray your slow cooker with non-stick cooking spray. Dump in the package of meatballs and dump the soup on top. Cook on LOW for 4 hours OR on HIGH for 2 hours. 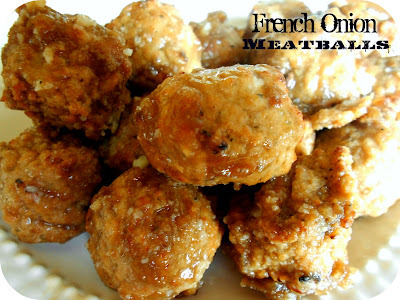 These make a great appetizer (poke some toothpicks in and you are good to go!) or we love to eat them on little rolls like sliders. My kids love that they are “kid-sized”. I make a similar style of meatballs using chili sauce and grape jelly. Yours looks like a new style I need to try too. OOOOHHHHH!!!!!! Yum, yum, yum Camille! Thanks for sharing! i am making these right now.....oh they smell so yummy!!! hope the kids like them. I love crockpot recipes....then I already have supper going and can spend more time helping the kiddos with homework. Do you add water to the soup too? Made this tonight and served it over rice as a meal with vegetables on the side. The family LOVED it! Question -- how do you keep the meatballs from falling apart? I keep thinking that after the cooking time they'd be so soft and disintegrate?!? We bought the pre-made frozen meatballs. They don't fall apart at all. Very moist and delicious. This recipe is so easy! A HUGE family favorite. How many people will this recipe typically serve? ?